Clarity, readability and rigor combine in the second edition of this widely-used textbook to provide the first step into general relativity for undergraduate students with a minimal background in mathematics. Topics within relativity that fascinate astrophysical researchers and students alike are covered with Schutz’s characteristic ease and authority - from black holes to gravitational lenses, from pulsars to the study of the Universe as a whole. This edition now contains discoveries by astronomers that require general relativity for their explanation; a revised chapter on relativistic stars, including new information on pulsars; an entirely rewritten chapter on cosmology; and an extended, comprehensive treatment of modern detectors and expected sources. Over 300 exercises, many new to this edition, give students the confidence to work with general relativity and the necessary mathematics, whilst the informal writing style makes the subject matter easily accessible. "This new edition retains all of the original's clarity and insight into the mathematical foundations of general relativity, but thoroughly updates the accounts of the application of the theory in astrophysics and cosmology, which have moved on considerably … The result is an indispensable volume for anyone wishing to develop a deep and physically well-motivated understanding of relativistic gravitation, and this new edition will no doubt become a classic text in its own right." 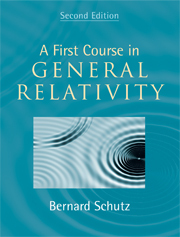 "Schutz has updated his eminently readable and eminently teachable A First Course in General Relativity. The result maintains the style of the first edition -- intuitively and physically motivated presentation of the subject. … This text will be appreciated by any upper level undergraduate with an interest in cosmology, astrophysics, or experimentation in gravitational physics." "Well laid out, developing logically and amply illustrated. Absolutely recommended."